52-page magazine, 10 scenarios on cardstock, 2 Platoon Leader campaign games (Bir El Gubi and Desert Crucible); 456 die-cut counters, Bir El Gubi historical map (4 12" x 18" light cardstock glossy map panels); St. Georges d'Elle historical map (2 12" x 18" light cardstock glossy map panels). Magazine includes (as stapled magazine pages) the Platoon Leader 4.0 rules. CH Annual Issue 3 is the third issue of Critical Hit’s revived ASL-related “house” publication. 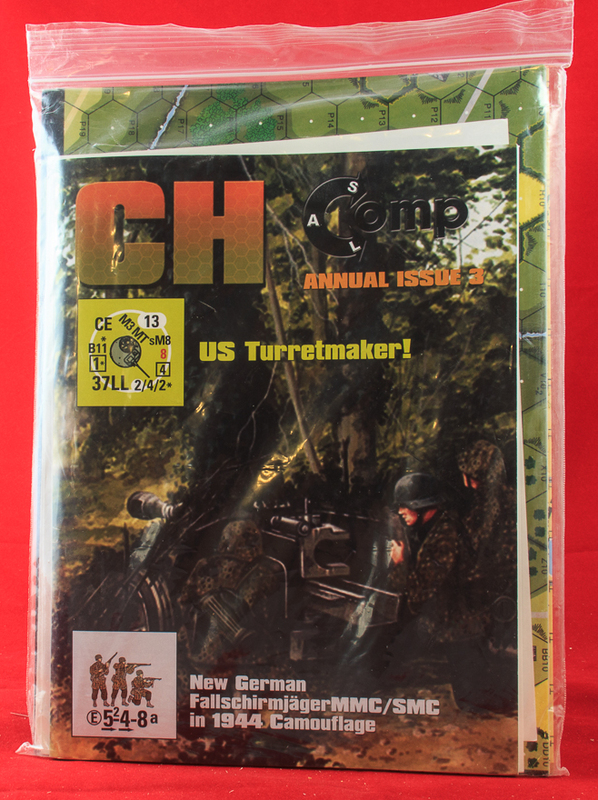 Each issue consists of a magazine and a variety of extras. The first issue did not get a very good write-up from Desperation Morale and the second issue actually received a Consumer Alert from this site, so the periodical’s beginnings have not been exactly very auspicious. 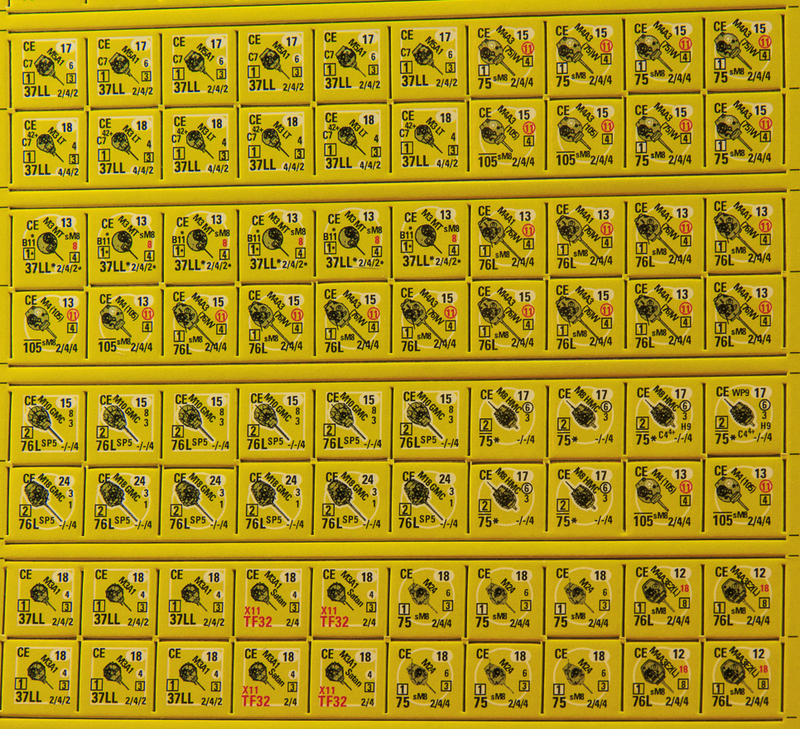 Taking this latest issue into account as well, it seems fairly clear that these annuals tend to consist of a variety of old previously-unpublished items from the dusty corners of Critical Hit’s vault of submissions, various recycled items, and occasional items from those few ASLers left willing to contribute to Critical Hit. The 52-page magazine is full color, of a print-on-demand quality. Leaving aside the various editorial ramblings, advertisements, and the like, the single greatest part of its content is, oddly enough, taken up by a rulebook: the Platoon Leader 4.0 rules. 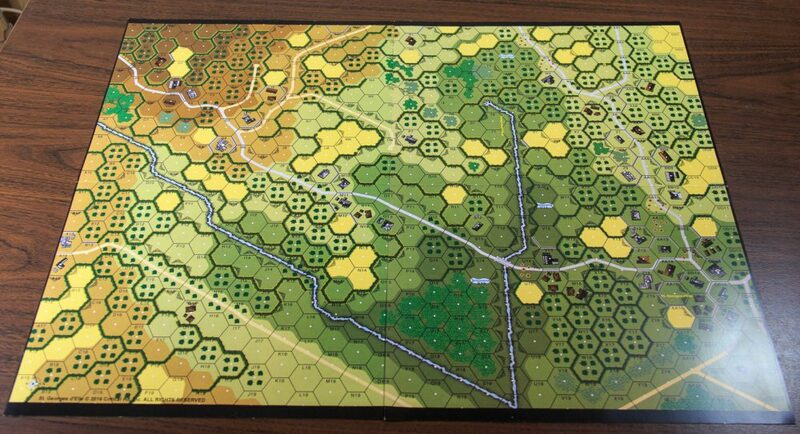 Platoon Leader is a rules system that allows players to play ASL campaign games on geoboards or historical maps. These rules, 14 pages long, do not even appear in the middle of the magazine, so that staples can be pulled open and the rules pages more or less easily removed; they occur at the front of the magazine, meaning that they have be cut out with scissors or scanned or photocopied. Not very user-friendly. In all likelihood they will be reprinted separately at some point in the future, however, so that more money can be made from them. There is no explanation as to what, if any, changes there are from the previous version of the rules. Despite being called Platoon Leader 4.0, the rules routinely refer to themselves as Platoon Leader 3.0, so there may not even be any changes. They may have basically been just copied and pasted in order to make the magazine thicker. However, for ASLers who do not have any previous version of the PL rules, they are useful to have and many PL campaign games have been created. 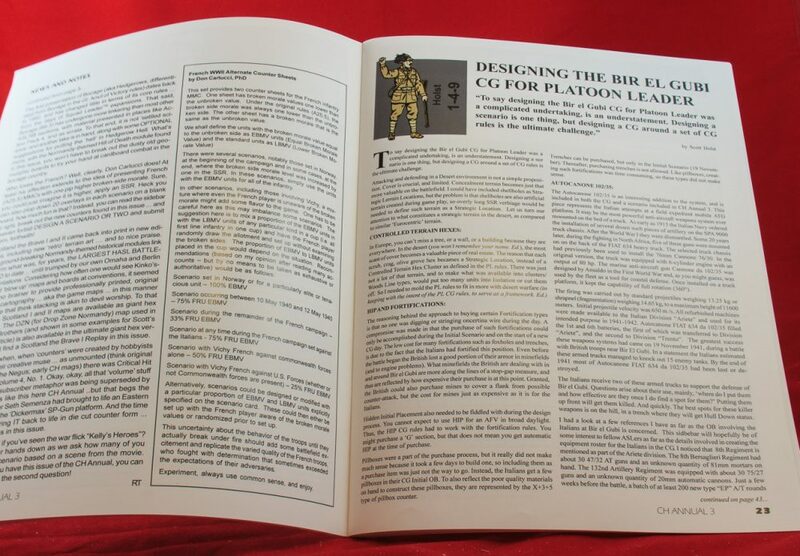 Next up is an article on designing the Bir El Gubi campaign game by its creator, the erratic Scott Holst, who has had a love-hate-love again relationship with Critical Hit over the years. More on Bir El Gubi below. Following that is an ancient scenario replay of a Scotland the Brave scenario. It is at least six years old, because the article’s author, Iain Daiglish (who also designed the scenario), died in 2011. It is probably well over six years old. What is more, it does not appear to have been a real game but only a solitaire game; no opponent is ever even mentioned. Finally, there are two articles that contain AARs of the playing of an Omaha scenario at a tournament in Texas. If this sounds familiar, it is; there were similar pieces in the previous annual. Among the various “extras” are two countersheets. 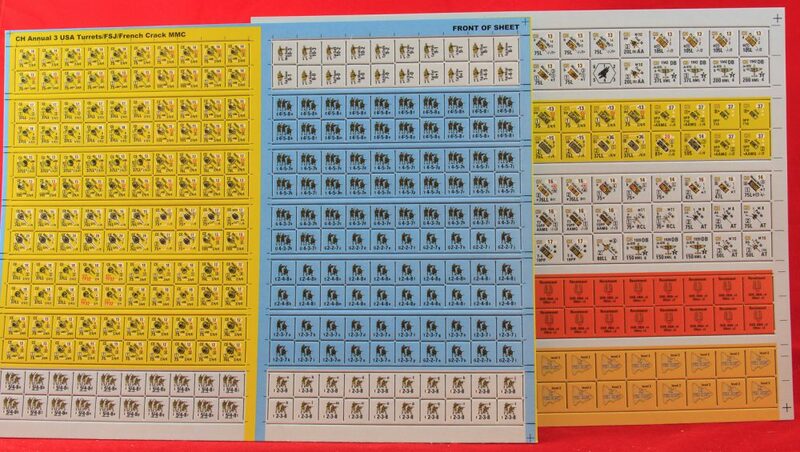 One is a sheet of 1/2″ counters, 96 of which are dedicated to variant turret counters for the Americans. These are part of Critical Hit’s “Turretmaker” series, the first two of which were released as standalone products. This, the third, was unceremoniously dumped here. 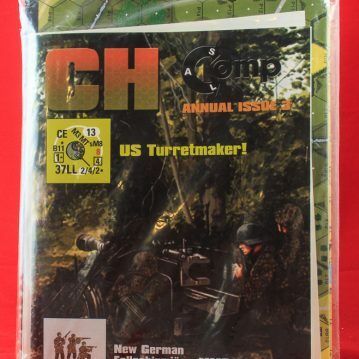 Read the Turretmaker write-up for more information, but essentially the counters jam all of the information from a 5/8″ AFV counter onto a 1/2″ turret counter, which is not very practical or user-friendly. Another 80 counters are French infantry counters that are like any others except that their back-side morale is not reduced by one. There are a few paragraphs in the magazine that basically say players can substitute these in scenarios where they think the French fought well. It is not really clear that anybody would ever actually use these, though, so they are more or less wasted (and a potential pain if carelessly mixed up with regular French counters). The remainder of the counters on the sheet are a seemingly random assortment of German 5-4-8 squads and half squads, and leaders. Not sure why these are here. 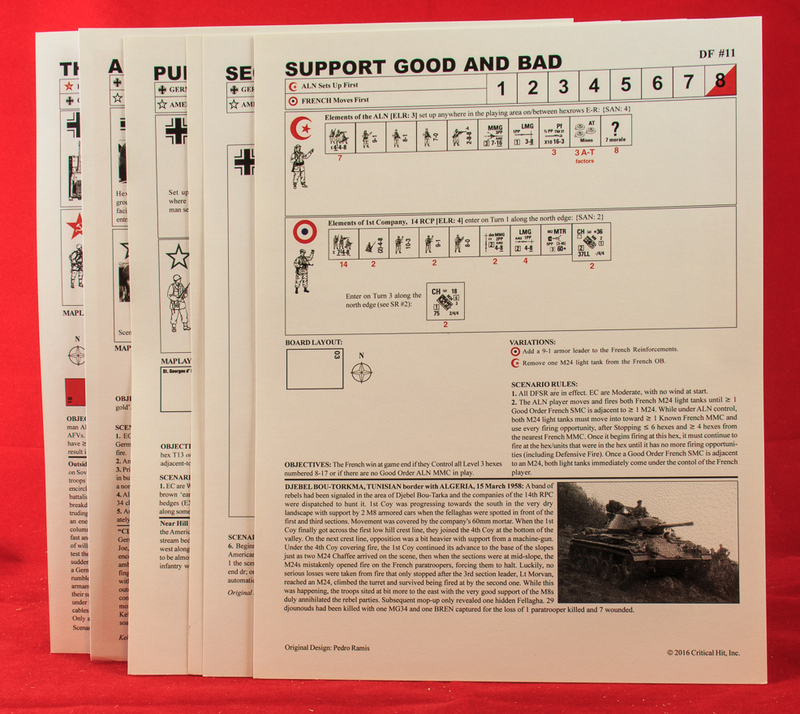 The second countersheet is a sheet of 5/8″ counters, which is also seemingly a random assortment of Italian, British, American, German, and Soviet AFV, gun, and aircraft counters. No explanation is given for their existence. 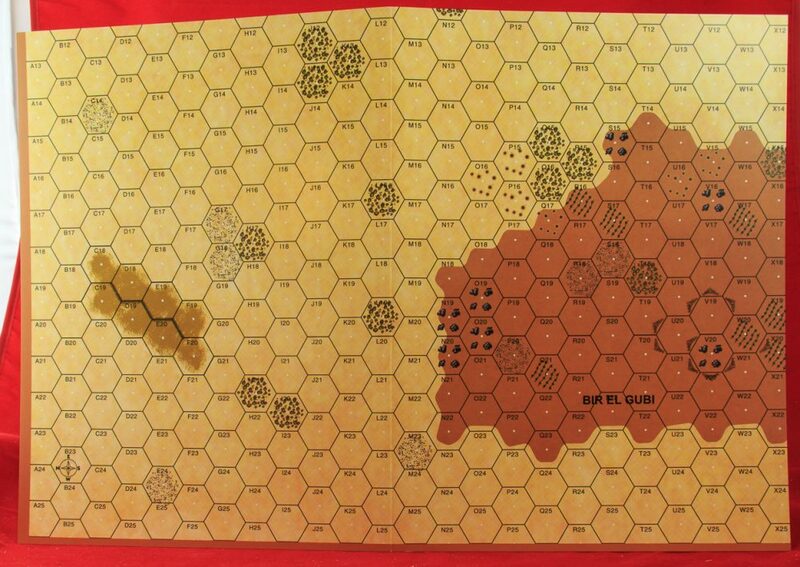 The first campaign game is the Bir El Gubi campaign game, designed by Scott Holst. This is not an original product; it was originally published by Critical Hit way back in 2012. So this is a re-tread; read the description of the product on that page for more information about its nature. 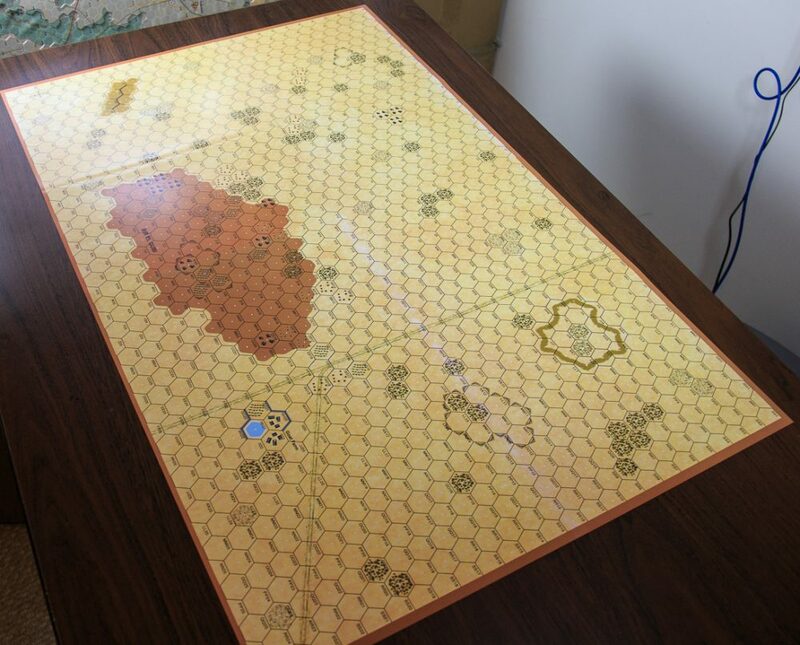 This desert Platoon Leader campaign game, was designed to be played on a large desert mapsheet (part of a short-lived series by Critical Hit) populated by overlays. 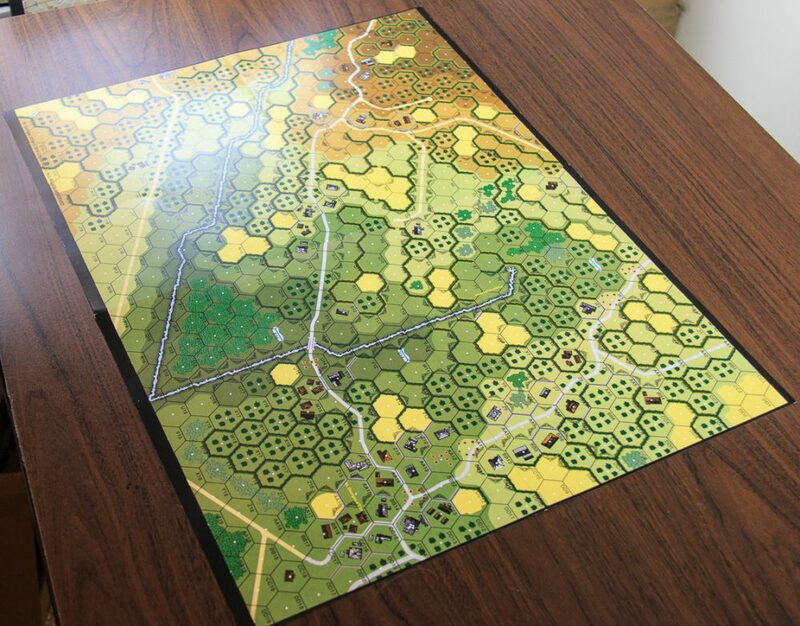 This new version abandons that strategy and provides a historical map in the form of 4 glossy light cardstock map panels (12″ x 18″ each) that are mated together to form the playing area. Overall, this is probably an improvement over the original. Scott Holst originally submitted, in addition to the campaign game, a set of designers notes and two scenarios. These were not included in the initial version of this product. Now, the designers notes (see above) are included, as well as one of the two scenarios. It should be noted that Holst never got any credit in the first edition of this product; at least now he is properly acknowledged as its designer. 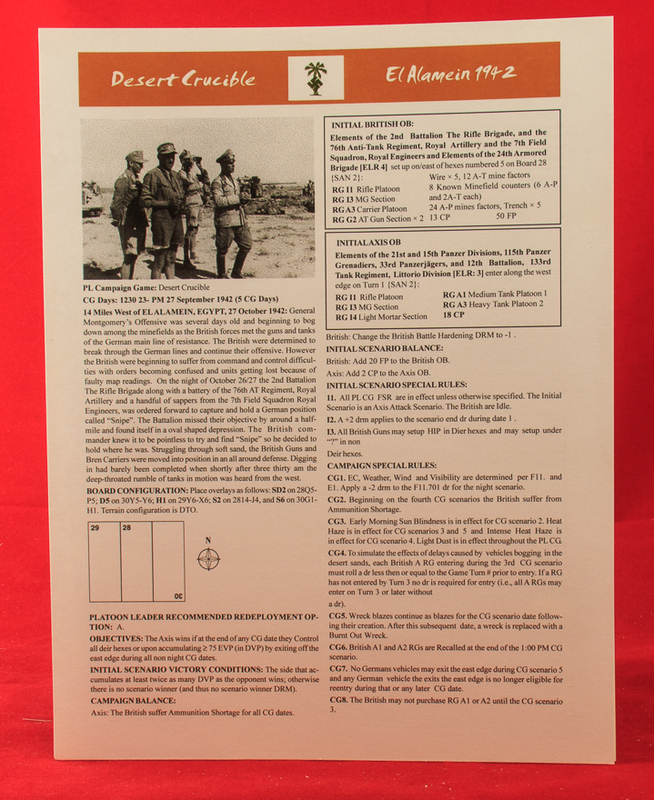 The second campaign game is called “Desert Crucible” and is part of the Battle of El Alamein in November 1942. Critical Hit claims that it is a “never before published, brand new campaign game.” Neither one of those statements appears to be true. It seems that this campaign game is actually Paul Kenny’s “Desert Crucible” campaign game, which was originally published in Fanatic Pack #4 way, way back in 2006. This is why one can’t really accept Critical Hit’s word on anything and must independently verify or confirm. The magazine describes this as something pulled “from the archives,” which suggests that Paul Kenny submitted it to Critical Hit at some point and got a negative or a non-response and later published it himself. Then, 10 years later, Critical Hit pulled it from their dusty vault and published it again. Critical Hit Annual 3 also includes a seemingly new Normandy-oriented mini-HASL. 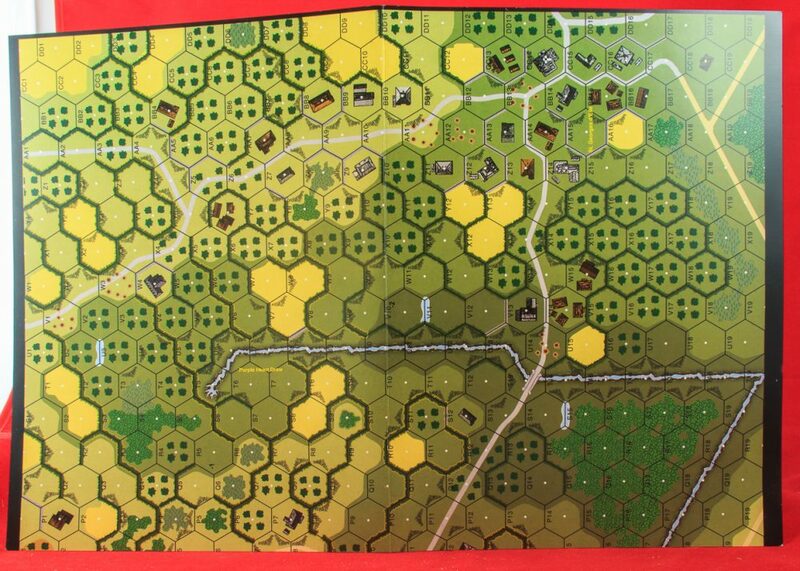 Larry Winslow is credited for “original scenario and map design.” This item includes what it calls the “St. Georges d’Elle” map, composed of two 12″ x 18″ glossy light cardstock map panels that are mated together. The map is actually centered around Hill 192 and “Purple Heart Draw,” the subject of a 2008 Lone Canuck HASL by the name of Purple Heart Draw. But here’s where it things get weirder. Around the same time as Critical Hit released CH Annual 3, it also released a HASL titled St. Lo: The Battles for Hill 192, also a Larry Winslow project, which features more or less the same map area as the St. Georges d’Elle map in CH Annual 3. Note that I say the same map area. Although one might be suspicious that Critical Hit had simply plagiarized from its own product, the truth seems more complicated, because the two maps are not identical. Indeed, there are substantial differences between them (including, perhaps, a distance in scale as well). Now, one would expect Critical Hit’s version of this terrain to look different from Lone Canuck’s version, because in such a case two different companies each interpreted how to conform the terrain to ASL differently. But what we have here are two different interpretations of the same terrain by the same company during a very brief time period. One of them can’t be as accurate as the other. What has transpired here? An analysis of the scenarios of the two products suggests that the Annual scenarios appear to be derivative of some of the St. Lo scenarios, with considerable points of match between various of the scenarios. As hard as this may be to believe, it looks as if Ray Tapio took the St. Lo map, modified it and perhaps shrunk it, and then rejiggered some of the scenarios from St. Lo to fit it. Critical Hit did something a bit similar to this in its Annual 2. But it just seems to illustrate perfectly the craziness that is Critical Hit. Annual 3 also includes two scenarios, DF11 (Support Good and Bad) and DF12 (Before Sunset on the Beni-Smir), that are for use with Critical Hit’s recent French Algeria project. They were probably scenarios held out of the original product for inclusion here. Finally, Annual 3 includes two stray scenarios. The first is a reprint of a scenario that originally appeared in Critical Hit Magazine as CH73 (The Standoff). The second is not a real scenario but some joke Kelly’s Heroes scenario. Insert eyeroll here. So that is it. A real mix of stuff, almost all of it old and/or unoriginal. Par for the course for the Critical Hit Annual.